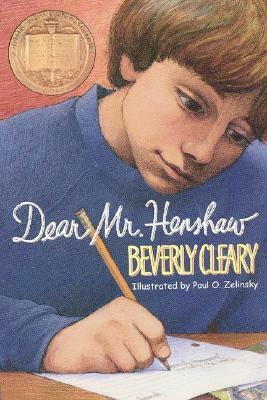 When I first decided I would spend my summer re-reading books I originally read in childhood Dear Mr. Henshaw was one of the first titles I thought of. I know that I read it, because I think I read almost every Beverly Cleary book my library had on its shelves when I was a kid, but I doubt I was much older than 8 when I last looked at it, and my memories were very, very vague. All I knew for sure was that the main character’s name is Leigh, his parents are divorced, and his favorite author is a man named Mr. Henshaw, to whom he writes letters. But it turns out that there is quite a bit more to the story than that! Leigh begins writing to Mr. Henshaw in second grade after he does a book report about one of his books. Leigh proceeds to use the same book for repeated assignments as he rises from grades two to six, and he continues writing to Mr. Henshaw, both to ask him interview questions for his book reports, and to share things about his own life. After a while, Leigh realizes it might make more sense to keep a diary instead of mailing letters to Mr. Henshaw all the time, and it is here that he records the details of the events in his life, such as a classmate routinely stealing from his lunchbox, and his struggle to cope with his truck driver dad’s long absences. I have always loved Beverly Cleary, but I have a newfound respect for her skills as a writer after reading this, her sole Newbery medal winner. I am so used to associating her with the Ramona books that I expected this book to have a similar tone and style. It surprised me to realize how different Leigh is from Ramona, in terms of personality, life experiences, and even sense of humor. Dear Mr. Henshaw takes place in a totally different world from the adventures on Klickitat Street, and it showcases Cleary’s ability to tell different types of stories about all different types of kids. In addition to speaking truthfully to the issues facing a child of divorced parents where one parent is often far away, Cleary also provides a great literary hero for the bookish boys of the world who love books and aspire to write themselves. By creating such a believable main character with all the concerns of a real eleven-year-old boy and giving that boy an interest in reading she promotes reading to a traditionally reluctant population without alienating or lecturing them. As a kid, it bothered me that Mr. Henshaw’s letters were not part of this book, and that we never really get to know the author who has so enchanted Leigh. As an adult, that didn’t bother me at all, and I actually appreciated that Mr. Henshaw is never given a chance to either upstage Leigh, or to disappoint the reader by not living up to the hype Leigh creates surrounding him. I do like that Leigh eventually meets an author who knows Mr. Henshaw, because that gave us a little glimmer of what the man must be like, but I really think it would have ruined the story to have Mr. Henshaw himself actually appear. I felt much better seeing Leigh’s dad make an appearance instead. Dear Mr. Henshaw is a natural read-alike for so many popular books these days. Leigh Botts kept a diary long before Greg Heffley, Big Nate, and Nikki Maxwell made it cool, and in my opinion, his is still the best. If you haven’t read Dear Mr. Henshaw since childhood, I highly recommend revisiting it. And don’t forget to share it with the kids in your life, too!